Mr. Chancellor, Susan Solomon is the Ellen Swallow Richards Professor of Atmospheric Chemistry and Climate Science at the Massachusetts Institute of Technology and is widely recognized as a global leader in the field of atmospheric science. She and her colleagues have made important contributions to understanding chemistry and climate coupling, including critically important research findings on the irreversibility of global warming linked to anthropogenic carbon dioxide emissions. After receiving her Doctorate in Atmospheric Chemistry from the University of California, Berkeley, Dr. Solomon embarked on a long and remarkable research career at the National Oceanic and Atmospheric Administration, where in 1986 she proposed that refrigerants and other industrial chemicals were responsible for the Antarctic ozone hole discovered a year earlier. Later that same year, she began work as the Head Project Scientist of the National Ozone Expedition at McMurdo Station, Antarctica where she and her team collected some of the earliest data linking chlorofluorocarbons to the deterioration of the ozone layer. She also showed that volcanoes could accelerate the reactions caused by chlorofluorocarbons, and thereby increase the damage to the ozone layer. Her work subsequently formed the basis of the UN Montreal Protocol, an international agreement to protect the ozone layer by regulating damaging chemicals. She has also worked as a member of the Intergovernmental Panel on Climate Change, which along with Al Gore was a co-recipient of the 2007 Nobel Peace Prize. Her many other awards include the National Medal of Science and the prestigious Vetlesen Prize, which recognizes globally significant achievement in Earth Sciences. She is a member of the US National Academy of Sciences, the European Academy of Sciences, and the French Academy of Sciences. 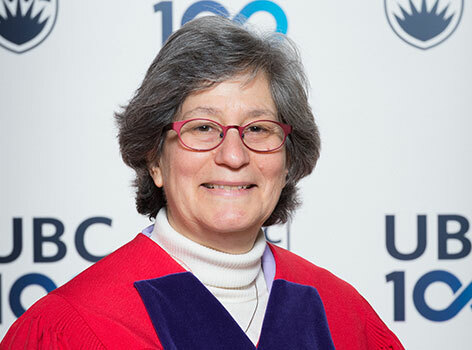 Mr. Chancellor, on behalf of a university dedicated to research excellence and sustainability, and in recognition of her extraordinary and critical contributions to climate change research, I ask you to confer the degree Doctor of Science, honoris causa, upon Susan Solomon.